Marinko Koščec (Zagreb, 1967) received his B.A. in English and French Language and Literature at the Faculty of Humanities and Social Sciences in Zagreb, and his M.A. in Literature at the University of Paris VII, France (le Diplôme des Etudes Approfondies). In 2005 he received a PhD in literature with the thesis on the French writer Michel Houellebecq at the University of Zagreb. He has worked as a part-time editor, having edited about 30 novels and collections of short stories. 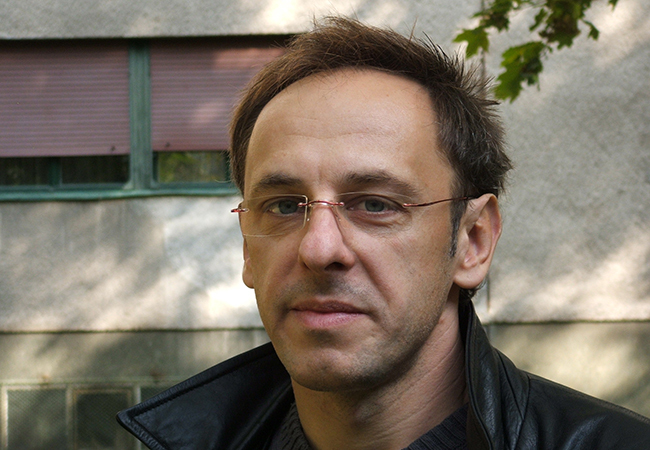 He teaches novel writing at the Creative Writing Centre (CeKaPe) in Zagreb and the Home of Creative Writing (KKP) in Split. His most important novels are Someone Else (2001) for which he received Meša Selimović Award for the best novel published in Bosnia, Croatia, Serbia and Montenegro, and Wonderland (2003), for which he received V.B.Z. award for best novel manuscript. There's a lot of good writing in A Handful of Sand, and there is also some very funny, dark humour in parts. The man is a literary editor, and his description of the chaotic life of a Zagreb publisher is both insightful and amusing. There is humour in this book – it is brittle, sharp and it’s nature dark, but it’s there and at times will raise more than a smile to your face. This novel is a portrait of a doomed relationship, charting the depression beforehand, the brief rapture and the bitterness of loss.